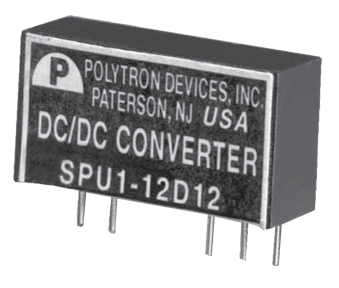 With 80% efficiency, our 1 watt single and dual output DC-DC converters offer the option of standard (1000 Vdc) or "HI" (3,000 Vdc) input/output isolation. The design also features 1-watt unregulated output power and a miniature single-inline package (SIP). Output Power: 1 watt max. 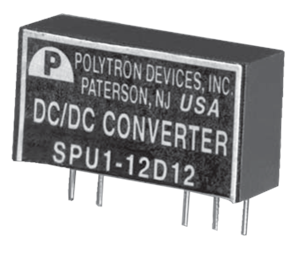 1The SPU1 Series requires a 10% minimum load on the output to maintain specified regulation. Operation under no-load condition will not damage these devices. However, they may not meet all listed specifications. Isolation Voltage Standard: 1000 Vdc min., Suffix-Hl 3000 Vdc min. Isolation Resistance: 109 Ohms, min.